Looking for a Saturday getaway? 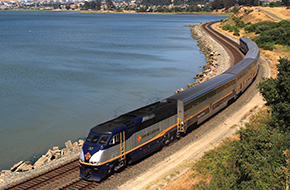 You can now buy one full-fare ticket for Saturday travel from now until September 29, 2018 aboard the Capitol Corridor and you’ll get another fare absolutely free. One-day advance purchase required. Please note that when booking, you must select “Adult” as the Passenger Type for all passengers, including Children and Seniors, in order to receive the discount fare. Where Will You Go with BOGO? This scenic 170-mile route runs from the Sierra Foothills and Sacramento, down to the San Francisco Bay and Oakland, and all the way to San Jose/Silicon Valley. Whether you want to get in some quality shopping time, enjoy the region’s fine dining options, or catch a game, the Capitol Corridor will get you there in style and comfort. Check out our route map to plan your trip. Through our convenient connector bus, travel to the City and tour its hilly landscapes, bustling downtown, cable cars and colorful Victorian houses. End your day at the iconic Golden Gate Bridge and take in a magical sunset. The California State Railroad Museum illustrates railroad history in California and the West and is one of Sacramento’s most popular tourist destinations. Afterwards, check out nearby Old Town Sacramento, and enjoy the unique old-time streets, saloons and shops. Enjoy spring and summertime fun at the 100-acre Great America amusement park, featuring a roller coaster and over 40 other rides and attractions. Suisun City is situated by the largest contiguous estuarine marsh in the United States. With a bicycle and sense of adventure, anyone can take the train to Suisun and explore this unique habitat. Avoid traffic and parking hassles. Take Capitol Corridor to exciting sports and entertainment events in San Jose, Santa Clara, Sacramento and the Oakland Coliseum. • This offer is exclusively available at www.Amtrak.com. • Valid for one free companion rail fare with the purchase of one regular (full) adult rail fare. • Valid for sale between April 6, 2018 – September 28, 2018. • Valid for travel only on Saturdays between April 7, 2018 – September 29, 2018. • Blackouts apply on all days except Saturday. • Advance reservations are required a minimum of 1 day prior to travel. • Up to 2 children ages 2-12 may accompany each adult at half the regular (full) adult rail fare. • Seating is limited. Seats may not be available on all trains at all times. • Fares are subject to availability. • Valid for travel on the Capitol Corridor and associated thruways; except not valid on the 7000-8999 thruway series. • The companion and full fare passenger must travel together on the same itinerary and have tickets issued together. • Not combinable with any other discount offer. • In addition to the discount restrictions, this offer is subject to any restrictions, blackouts and refund rules that apply to the type of fare purchased. • Fares, routes and schedules re subject to change without notice. • Once travel has begun, no changes to the itinerary are permitted.